I've built a basic ray tracer that creates rays at the origin whose direction fans out around the -Z axis for each pixel in the image. Each ray is then tested for intersection against every surface in the scene (currently, only spheres are supported). 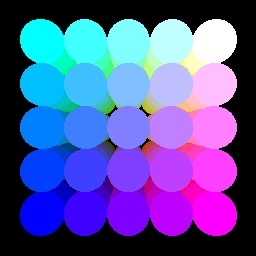 If a ray hits a surface, the color of the surface is used as the color of the pixel. 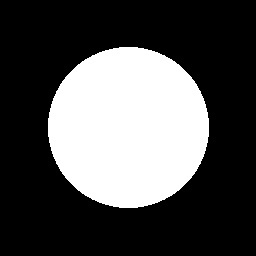 An image of a single white sphere of radius 3 and position (0,0,-10). My first test scene to make sure the ray/sphere intersection code was working. 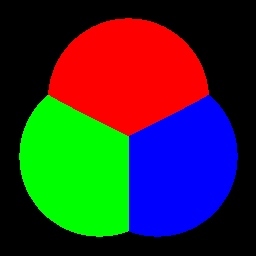 Three intersecting spheres, all at the same depth. I used this scene to test the closest hit code. A cube of spheres (colorcube). The color of each sphere is determined by its position in space. Red is along the X axis, green along Y and blue along Z. All of the images above can be regenerated by specifying the appropriate scene file on the command line of the rayn program rayn-01.zip (175 KB). The source code is included in the zip file. Here is a description of the command line parameters for rayn. -background <red,green,blue>   background color (int,int,int).